Middlesex County criminal lawyer Leon Matchin is devoted to protecting the rights of individuals charged with drug and alcohol-related offenses, assault and theft crimes, and all types of traffic violations. For over a decade, Mr. Matchin has worked closely with clients to explore all legal remedies and avenues to relief. He continues to provide uncompromising representation and exceptional service to clients throughout New Jersey. Mr. Matchin has successfully prevented the admission of unwise pleas and incriminating evidence obtained after arrest. Absent proof of culpability under the high standard of “beyond a reasonable doubt,” which applies to each of the crime’s material elements, the case must be dismissed. An accusation of assault or another violent crime can have a devastating impact on a defendant’s future that goes beyond any criminal penalties that they face. Middlesex County criminal attorney Leon Matchin recognizes the significance of what is at stake. He can explore whether a defendant can attack the prosecution’s ability to prove each element of the charge. For example, some assault charges require a level of intent or recklessness in the defendant’s actions, which may not be easy to prove. A self-defense argument may be appropriate in certain cases in which the accuser instigated the altercation. The defense would need to show that the use of force was reasonable and proportionate to the threat. Even if you cannot defeat a charge, you may be able to get a significant reduction in the level of the charge, such as a reduction from aggravated assault to simple assault. New Jersey law imposes severe penalties for possession and trafficking of controlled substances. If you are facing a drug charge, you should be aware that you may have both substantive and procedural defenses. The U.S. Constitution provides protections against searches and seizures that are not supported by a warrant or probable cause, and these are often relevant in drug crime cases. If law enforcement did not follow these rules and cannot legally justify deviating from them, a criminal lawyer in Middlesex County can file a motion to suppress the improperly seized evidence. This can destroy the prosecution’s case in some situations because there may be no other evidence to prove the charges. A theft crime like shoplifting requires the prosecution to prove that the defendant intended to take property from someone else and deprive them of it permanently. This may include hiding or concealing the property, as well as altering an item or removing a label that shows its value. Shoplifting may be charged as a disorderly persons offense when the full retail value of the item is less than $200. A higher degree of shoplifting may result in more serious penalties. The criminal history of the defendant also has an impact on the charge and penalties. However, a defendant may be able to argue persuasively that they did not intend to take the item without paying for it. These cases often require a thorough investigation of the circumstances, which Middlesex County criminal lawyer Leon Matchin can undertake for you. DUI is known as DWI (driving while intoxicated) in New Jersey and technically is not a criminal offense. This does not mean that it should be taken lightly. A DUI charge can lead to serious consequences, such as a license suspension that undermines a driver’s ability to go to work or school. Fortunately, there are often compelling defenses in these cases, even if the driver’s BAC was found to be over the per se limit of 0.08. The police officer may have lacked an adequate basis for the stop, which would prevent the prosecution from using evidence obtained during it. Or a DWI attorney might argue that the machine reading the BAC was not functioning properly or was not properly used by law enforcement. Defenses to a DWI that is not per se might include challenging the administration of a field sobriety test or the officer’s interpretation of factors such as bloodshot eyes or slurred speech, which may have an innocent explanation. Traffic offenses are set forth in Title 39 of New Jersey’s Motor Vehicles and Traffic Regulations. Criminal conduct and traffic violations are related in many of these statutes. Drivers, for example, may be convicted of assault if they cause bodily injury to another person while operating a motor vehicle. Under N.J.S.C.39:4-50.4a, an assault “by auto or transportation vessel” can be a third-degree crime if the driver operates the vehicle while racing or intoxicated and serious bodily injury results. Alleged traffic violations can be effectively defeated with the help of an experienced attorney. Mr. Matchin has successfully challenged unreliable breath test results, police mishandling, and evidence obtained through an illegal search or seizure. Obtaining lessened or dropped charges can preserve driving records and prevent exponentially increasing insurance rates. The ability to reinstate driving privileges also protects motorists from further violations based on operating a vehicle without a license or insurance. Knowing their dependence on cars to get to work and move freely in life, clients rely on Mr. Matchin to protect their rights. If you are facing a criminal charge or an alleged traffic violation, Leon Matchin can help. Seek legal counsel before talking to law enforcement or appearing in court alone. 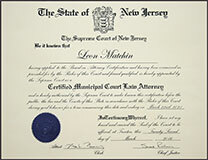 For legal assistance in the Municipal and Superior Courts of Middlesex, Monmouth, and Mercer Counties, as well as in other local communities, call Leon Matchin today at (732) 887-2479 for a free consultation or contact us online.